Jo-Anne Yau is focused on protecting growing businesses and representing injured people. Ms. Yau has represented businesses across the United States, and inventors, artists, and musicians from around the world. To best represent her clients who are athletes, Ms. Yau is a licensed Sports Agent. Her experience also includes litigation of various legal disputes in Florida, including personal injury claims resulting from car accidents and slip & falls, and criminal defense of misdemeanor and felony charges. After graduation from Florida Coastal School of Law, Ms. Yau joined a prestigious law firm in the heart of downtown Jacksonville. There, she was mentored in the areas of Personal Injury and Criminal Defense. She learned strategies to negotiate settlements and plea bargains. In addition, she became skilled in the art of litigation in Civil and Criminal Courts. In addition to the firm’s traditional areas of practice, Ms. Yau had the opportunity to develop a new department: Corporate and Intellectual Property Law. Within five years of taking on Trademark, Patent, Franchising, and Business clients, the firm was able to open a satellite office, devoted solely to these areas of practice. Ms. Yau started Yau Law to once again bring her Personal Injury, Criminal Defense, Intellectual Property, Franchising, and Business clients together in one office. From car accidents to slip & falls, and from misdemeanors to felonies, Ms. Yau is known for personally conducting consultations with her clients. It is her philosophy to educate her clients of their rights, and let them decide how their case should be handled. The rapid growth of the Yau Law Firm caught the attention of the Women Business Owners of North Florida. At their annual awards banquet, Ms. Yau was honored as the 2012 finalist for the coveted "Entrepreneur of the Year" award. Ms. Yau makes education a priority. This includes educating the community as well as her client. Recently, the National Judicial College has invited Ms. Yau to the faculty, to teach courses to judges across the country. The American Medical Writers Association is featuring Ms. Yau as the legal keynote speaker when their annual conference comes to Jacksonville in October 2011. She is an Adjunct Professor at Florida State College of Jacksonville, teaching Personal Injury Law in the Paralegal Studies department. She is also a Judge and Coach for the Mock Trial program at Florida Coastal School of Law, and taught Franchise Law there. In addition, every quarter, Ms. Yau offers free seminars to the community, and she is the co-host of “Business Talk” on Blog Talk Radio. Her topics include "Tips to Start a Business," "Using Trademarks to Protect, Promote, and Produce More Business," "Franchising: From Emblems to Empires," "Personal Injury Claims—Navigating Insurance Claims," and "Preserving Evidence of Your Personal Injury Claim." Franklin Pierce, a law school in New Hampshire with a curriculum centered around intellectual property, commerce, and technology, took an interest in Ms. Yau’s manuscript, "Stealing What’s Free: Exploring Compensation to Body Parts Sources for Their Contribution to Profitable Biomedical Research." Franklin Pierce Law Review published this article in their journal in 2006. 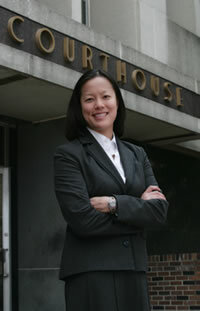 Prior to her law practice, Ms. Yau received her J.D. from Florida Coastal School of Law, on the Dean’s List, in 2004. In law school, she was awarded the Pro Bono Distinction for her dedication to legal and community services to the less fortunate. She was also awarded the Best Oral Advocate award. Furthermore, she served two terms as Vice Magister of Phi Delta Phi, the Honors Society. Upon graduation, she was honored with the Founder’s Award, for upholding the objectives and values of Florida Coastal School of Law. She received her B.S. in Biology from the University of Calgary, in Canada in 1999. Florence Chen is a Partner at the Yau Law Firm and finds excitement in seeing businesses grow. Her priorities lie not only with protecting businesses, but she also dedicates her time and energy to representing injured people as well. Ms. Chen is a current member of the Florida Bar, and is admitted practice in Federal Court before the Middle District of Florida. Her experience as a voice actor is invaluable to the firm’s Entertainment Law practice. For over five years, Ms. Chen has voice acted and narrated for various animations, films, and projects. She was even contacted by an XBOX game developer for “Dust: An Elysian Tail” for an audition. Ms. Chen’s creative background is another foundation for her contribution to the firm’s Intellectual Property departments. She is a published author, including “The Friend,” an internationally distributed children’s magazine owned by the Church of Jesus Christ of Latter-day Saints. Her Thanksgiving story appeared in the November 2012 edition of the magazine. Born and raised in Houston, Texas, she spent many of her childhood and adolescent years helping her family with a real estate business. Because of the nature of her family’s business, Ms. Chen is experienced in various housing and real estate issues involving contractual negotiations and litigation. Later, she moved to Provo, Utah, where she received a Bachelor of Arts degree in Broadcast Journalism from Brigham Young University. Ms. Chen was the graduating class speaker for the Department of Communications in 2006. Ms. Chen then moved to Jacksonville, Florida where she attended Florida Coastal School of Law. While in law school, Ms. Chen was involved in various honor societies and groups, including the nationally recognized Moot Court Honor Board and Mock Trial. Ms. Chen is the recipient of numerous awards, such as Second Place Best Advocate at the National Appellate Advocacy Competition, Second Place Closing Arguments Competition by Spohrer & Dodd, and Best Defense Advocate. Because Ms. Chen was the finalist for the law school’s internal Moot Court competition, she was one of two individuals to have argued before the Eleventh Circuit Court of Appeals in 2010. Ms. Chen earned her Juris Doctor in 2012, graduating with honorary certificates for Advanced Research & Writing, Pro-Bono Work, Moot Court, and Mock Trial. Ms. Chen has earned over 50 awards given by local and national schools and professional societies. In her spare time, Chen enjoys swimming, reading, and writing.